The circus leaving my place in east van en route to school, daycare, and work. 1) Equipment: A suitable bike can be purchased between $200 – $800. It’s important not to get a really cheap bike because you will likely end up having to pay for costly repairs within the first few months of owning it. Secondly, a proper helmet is an absolute must. 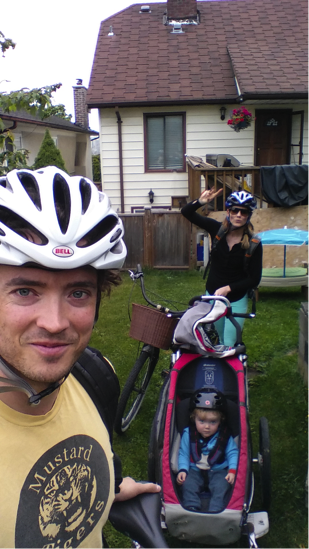 Don’t even think about buying a helmet used; budget $60 – $150 for a stylish new lid. Thirdly, you will need a waterproof bag, jacket, lock, and lights to be fully prepared to ride throughout the fall and winter, and of course, home safely from the pub. There is a massive price range for all of these items, but you will be safe if you budget around $300. Although this may seem expensive, remember that it only represents 3% of the total cost of your MBA. If you make this relatively small investment in your health and education, I guarantee you won’t be disappointed with the ROI. 2) Time Management: I think the ‘secret sauce’ of thriving in an MBA program is having strong time management skills. This means that valuing your time, regardless of whether you are studying, socializing, exercising, or in meetings is key to your overall success as a student. As such, by committing to biking to school next year, you are actually saving yourself a lot of time. Here is an annual comparison of bike commuting vs. taking transit, based on my 184 days at school, with each trip totaling 16 km. As you can see, I have exceeded my basic cardio requirements by 44 hours, while also reducing my overall transit time. This has enabled me to come home in the evenings and spend quality time with my family without the stress of feeling like I need to get out of the house to exercise. 3) Perceived Barriers: It’s quite normal to be intimidated by the thought of bike commuting in a new city. For newcomers, the most common concerns are: lack of knowledge about safe bike routes, bike storage, and access to facilities, such as a showers and change rooms. Luckily, Vancouver is a world-leading city for biking infrastructure and has hundreds of kilometers of well-marked bike lanes. In addition, the city has several online bike resources to assist residents in mapping out their ideal routes. Students at Beedie are encouraged to lock their bikes to the rack directly in front of the main entrance to the school. With the entrance being in a well-lit and high traffic area, I have left my bike there for the year without any issues. There is a more secure option in the basement of the school; however, you will need to get the password to the door from a current PhD student or faculty member – information that may cost you a coffee or two. Lastly, next to the bike room in the basement are private shower facilities that are well maintained and are in close proximity to the lockers. In closing, I hope I have convinced a few people to consider bike commuting to school next year. Being a full-time student is a great opportunity to make behavioral changes both professionally and personally – bike commuting is a great behavior to adopt. One thing is for sure, whether you run, walk, bike, or take transit to school next year, I guarantee you are in for a fantastically rewarding year at the SFU Beedie School of Business. 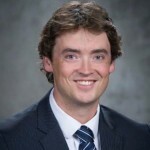 Adam Hull is a current MBA student at Beedie. He served as the President of the Alberta Alpine Ski Association from 2010-2014, where he?developed skills in leadership, sales, and marketing.? He was drawn to the MBA as a way of developing deeper quantitative analysis skills to assist in his transition into the private sector this fall. Adam can be reached at ahull@sfu.ca or on his LinkedIn.